Firm but fair. Patient while knowing when it's time for action, Aedan has had a varied career in the Jedi Order with almost no equal. Experienced and pragmatic, he knows when to be serious and when to joke, and can be depended upon to put in a common-sense perspective when it comes to a discussion. He is virtually always with good intentions, and in his heart he seeks only to help the Galaxy become a better place; to help people, something he feels the Jedi Order has lost sight of. He tends to put others before himself as a rule of thumb - what is one man's life in the face of the Force? He was brought into the Galaxy courtesy of an unusual union between a Dark Jedi and a simple maiden. His mother died in childbirth and his father had long since disappeared into the depths of the Galaxy, leaving Aedan entirely in the hands of his brother 9 years his senior - Aaron. Life was hard at the best of times, the streets being a harsh teacher that gave the test first and the lesson last. In such an environment, an orphanned child had to mature quickly or perish. Aedan matured. A disease had been passing through the planet of Coruscant, and from what Aaron managed to overhear from spacers it was happening all across the Galaxy. Aaron made a point out of avoiding any who looked even slightly diseased, and Aedan followed his example. It was better to be safe than sorry, no matter how harsh it might seem. Harshness was what kept you alive when you were a homeless orphan. Demonstrating unusual quickness of foot, and a seeming ability to see things before they happened, it was almost child's play for Aedan and his brother to survive by stealing from others. Even in the undercity of Coruscant, it was remarkable just how easily they repeatedly escaped the clutches of those who would do them harm, especially Aedan. Such remarkability did not go unnoticed. Unsuccessfully attempting to 'pocket a brown robed figure, both Aedan and Aaron were captured by him with humiliating ease. It was then that they discovered his identity as a Jedi, as well as their own potential to become Jedi - they were sensitive to the Force. During the entire time, however, the Jedi looked at Aedan suspiciously, as if he was different somehow. Aedan merely passed it off as he being the one to try and pickpocket him; little did he know, he couldn't be farther from the truth. Both quickly agreed to this path of life - it was a darnsight better than living their entire lives on the streets, stealing to survive. Aedan sometimes looks upon this as perhaps the greatest mistake of his life. Aedan was only 6 when he joined the Jedi Order, in the year 372 ABY. The Jedi were increasingly being doubted in the Galaxy, as peace slowly but surely began to break down. While the Jedi did their best to shield the Younglings and younger Padawans from this, trickles of it came through in hushed whispers. The Jedi were no longer the heralds of justice and peace in the Galaxy, it seemed. While Aedan didn't understand at the time, Aaron increasingly grew worried at this. He questioned what they had become a part of. Shortly after joining the Order, he and Aaron were seperated - family ties would only serve as a distraction from the Jedi Way. While Aaron took almost 5 years to become a Padawan, Aedan accomplished it in mere weeks. His progress was unimaginable and his potential limitless, and more than just a few Jedi were in awe of him - and a number of them worried. It threw his ancestry into question. All that was known - and this learnt from Aaron - was that their father was a Dark Jedi. However, they had different mothers. Aaron's was called Coci Drexel. Aedan's was called Kyrie Shan. 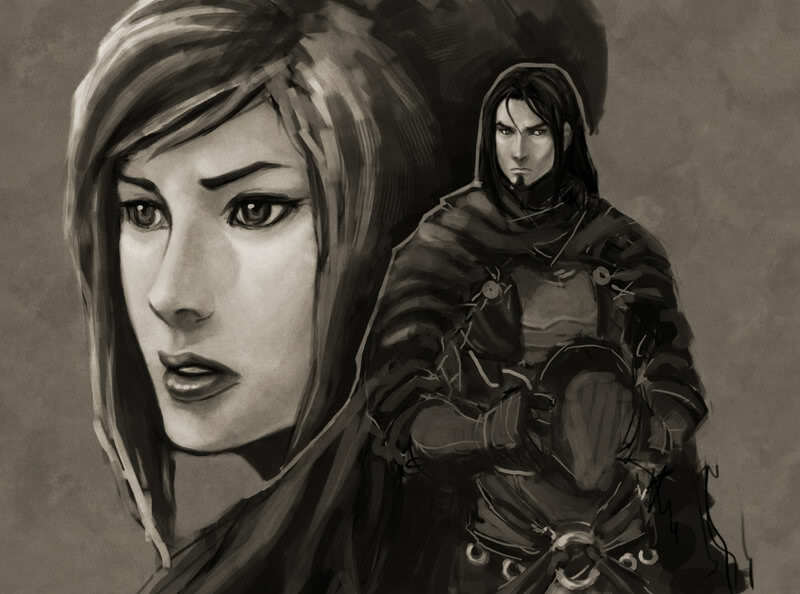 Further investigation, disguised as medical tests and examinations, concluded that Aedan was indeed a part of Revan and Bastila's bloodline, although the link was almost completely hidden, nigh upon undetectable it was so small. It was very thin, having been warped by the many other bloodlines that had become a part of it, but it was there - and the Jedi concluded that this was why he had such unimaginable progress. That, and because it was the will of the Force. And while it was a thin link with barely any influence on Aedan, it was a link nontheless. For this the Jedi decided to keep him close, and watch him even closer, trying to ensure that he followed the path of the Light Side. Aedan never really gave his Master - Rhan Komo - the chance. He wanted to learn. About how to wield a Lightsaber, about the Force, about how to use it, about how to use it against or for people, about many things. The list was nearly endless. Yet whenever it came to a lesson about the Jedi Code, or Jedi Morality, it was exceedingly rare that Aedan would pay any attention whatsoever. Needless to say this worried both his Master and the Jedi as a whole. Instead, he was shown what could happen when somebody did not follow the Jedi Code. When somebody fell from the Light and into Darkness. Yet this did nothing to persuade Aedan. If anything, it alienated him from the Jedi even more. He questioned the Jedi Code, and the Jedi as a whole. The Jedi seemed to think that if you did not follow the Jedi Code, you were doomed to fall to the Dark Side no matter what you did or who you were. This shocked the Jedi Order and, blind to his words, they continued with their way. The whole affair made Aedan sick. And so he pursued the Jedi Code with an unprecedented vigor, surprising his Master entirely. Yet he did not do it for the reasons Rhan suspected - Aedan examined them, criticised them, pointed out flaws. He searched specifically for what was good and what was wrong with it. Such study engraved it into his memory, which was part of his intention - it would serve as a reminder of what the Jedi stood for. And what was wrong with what they stood for. His training continued without a hitch, and at the age of 21 - 387 ABY - he passed the trials and became a Jedi Knight, possibly one of the youngest in history. By this time, the Jedi's reputation had been damaged immensely in the eyes of the Galaxy. It had gotten so bad that the Chancellor was even arranging for the Jedi's removal from the Republic, frustrating more than just a few of them. And while Aedan might have done the same, he suspected that the motives behind the Chancellor's actions were...less than pleasant. He mentioned as much to the Council, who - outwardly - seemed to pass it off as being nothing. Yet it was clear that they were disgruntled and concerned with what was happening. There was a Darkness somewhere in the Galaxy - perhaps even within the Republic itself. Feeling his words may have been ignored, Aedan politely bowed his head and moved away. Waiting to see what happened. What happened next he could never have foreseen. The Chancellor had been assassinated. The Jedi were to blame, having been assumed to be the ones who killed the Chancellor. The Grand Jedi Master had been arrested and was sledged for execution under the charges of treason, as well as new laws justifying what the Republic was doing. The Jedi had been exiled to Ilum, Aedan included. Before Aedan could reach them, the remaining Council Members had already rushed off in an attempt at freeing the Grand Jedi Master. They died quickly enough. A year later the Grand Jedi Master had been executed, immediately after two former Jedi Knights that Aedan once served alongside became the new Chancellor and Vice Chancellor. The connection wasn't very hard to make. Whether they were Dark Jedi, Sith or merely misguided followers of Ashla, they were clearly enemies of the Jedi Order. An Order that had long since lost sight of what was important, of why it existed. Aedan did the only thing he could imagine himself doing in this situation. He decided to leave the Order behind. At first his brother Aaron - having become a Sentinel - attempted to convince him to stay, but upon seeing that Aedan would not be dissuaded he instead elected to join him. Working together, they planned their departure from Ilum - and from the Jedi Order. The Order seemed to already be preparing for departure, to one place or another, and after a little investigation Aaron revealed their destination to be Corellia - supposedly. With this in mind, the two Brothers initiated their plan. Aaron managed to covnince a hired frigate by the name of "Crusader" and her crew into joining the two of them, at least for a time, whereas Aedan worked on modifying logs and rosters and other sources of information. While it would not work forever, it would clear them for departure, and by the time the Order would realise the two brothers would be far away from Ilum. They never could have anticipated that there were Jedi would want to come with them. Many of those who discovered what Aedan and Aaron were plotting did not turn them in, but instead sought to join them. Little by little, the two unwillingly ended up recruiting nearly two dozen rogue Jedi who were similarly disillusioned by the Jedi Order - and they all turned to Aedan, as if for guidance. It was not a feeling he was accustomed to, nor one he ever expected to have, but these people needed him. With that in mind, he was honored to guide them. They often called him "Master" as a formal title, especially Aaron, and in a way he was their master. It quickly occured to Aaron that this little following of theirs would need a name of some description, something to refer to them by. Aedan knew just the one. So it was that the Ashlan Order was born. An Order dedicated to only two things - helping those in need, and opposing the Dark Side. Aedan and Aaron - left and right respectively - on the bridge of the Crusader. Weeks later the Ashlan Order put their plan into action. And it worked. Aedan, Aaron and the rest of the Ashlan Order were free from the Jedi Order and had become Grey Jedi, Jedi with allegiance to no person and no single ideoligy. And to the Jedi Order, Dark Jedi to be hunted down and exterminated whenever possible. This last thing Aedan quickly found out, and it was something that would scar his view of the Jedi Order forever. Aaron was even more injured; how could people who follow the Light possibly be so absolute, so extreme, so harsh and crude? In his eyes, perhaps the Light was not as "good" as the Jedi liked to preach. While Aedan cooled him away from this path, the thought followed Aaron around like a bad smell. At first they were at a loss of what to do. This concerned Aedan - he always knew what to do, how to do it, when to do it. Never had he been clueless as to where to proceed. Eventually, it came to him. Recent reports dictated that pirates operated extensively at Corellia, and the Republic saw fit to hold a blockade there. Perhaps here, the Force willing, they would unveil some sort of clue as to why the Republic had turned out how it did. After digging up the necessary information, Aaron revealed that Bothawui and the Hapes Cluster were smuggling food and supplies in to the needy citizens - and were making no secret of it. Leaving the Crusader to anchor at a nearby planet, Aedan, Aaron and several other "Ashlan Disciples" hired smugglers to take them down to Corellia as a part of their cargo. For enough credits they happily obliged. For weeks they examined the planet, looking for even the slightest trace of what might have turned the Republic into what it had become. They found something altogether different. It appeared that even after all this time, the Mandalorian Clans had survived. An artist's impression of Aedan Drexel at age 34, with a nameless woman in the background. It is often assumed to be his mother, Kyrie Shan, although theories abound. First, languages: I don't think it is humanly possible for you to produce the sounds of Trandoshan, Shyryyiwook, and Rodese. Besides, where would one learn that many languages? I would also suggest these stat changes. Why does a jedi need thermal detonators? How are you a Grey Jedi and associated with the Order at the same time? I'd also like to see how he learned Mando'a and why he has a beskar helmet. If he associated with mandalorians, that would easily clear that up. If you need to speak with me, I'm easily reached on xfire, or you can just ask questions or talk about it here. Heal is for OOC healing. He has no such ability IC, nor do I think he'll need it. Mind Trick stays. It's an essential ability for most Jedi. Absorb's likewise necessary, in order to combat the more powerful abilities that may come his way. Force Defend can only take you so far. Aedan is renowned for being unorthodox, and in his history having weapons aside from a Lightsaber has saved his life a number of times. Hence the Thermal Detonators. He is a Grey Jedi associated with the Jedi Order, as in he has close ties. He is not entirely indepenant from the Order, yet he is not entirely a Jedi Knight. He follows his own agenda, yet he works closely with the order - both to avoid being persecuted, and because it furthers his own goals. He didn't learn those languages. They're a result of Force Comprehend. He doesn't have a Beskar Helmet, just the Facemask. And that's because he carved it off a Mandalorian mid-battle, as is written in the history. Just as soon as I actually write it. The rest i'm fine with. Mind trick is going to 0 because there is no reason for you to have it. You can use it as a text power on the weak-minded but there is no point in having the actual power. Keep Absorb at 1 if you'd like, I don't care. I don't seriously believe that the Jedi Order would associate with Gray Jedi. You either go all the way or stay in the order. It can't be freelance, you swore to your duty, or you abandoned it. I liked the throwing knives and I will discuss the thermal detonators with avenger/centaur. I know avenger for one didn't like the idea of Grey Jedi, until we agreed with the notion that they were illegal in all parts of republic and coalition space. If captured, they will be sent to trial and executed. Worse yet, they might just be executed. If the jedi captured a grey jedi, however, it would be more of a imprisonment and questioning. As for mind trick, I'm alright with it how it is, it's a useful power, and just because he IS a guardian doesn't mean he doesn't know it. Thermal detonators are alright with me. It's bound to come in handy. Pull definetely down to 2.. Heal doesn't need to be listed if it's for ooc purposes. Grey Jedi that works with order is a big no no. He would be imprisoned and questioned as athanasios said, and then tried by the Coalition and most likely executed. You're all in or you're all out. Roger. He's all out then. The Republic Armor he retrieved prior to the seperation, yes. As a compromise i'll lower MT to 1 and raise it to 2 through IC means. Also, I raised heal to 1, basic training as it were. Both because most Jedi would have at least -some- training in Heal to heal cuts and bruises, and because of his history which i'm writing up now. PS Added a shedload of history. Still a heavy WIP. Maybe later tonight. Forever Alone, it regrets me to inform you that your "Ashlan Jedi Order" will need to be further looked into before it is approved. Save questions and comments until the history's complete. Something happens to the Ashlan Order which leaves Aedan the sole remaining member.